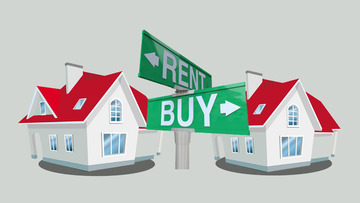 A recent study notes that it takes less than 2 years for owning to make sense over renting. So if you're planning on moving in a year or two, then staying a renter is the better choice. If you are looking to stay 3-5 years, then buying is likely best for you. 3. Can you afford to buy a home? Are you stretching or can you afford the home you are looking to purchase? Be sure to understand your budget and the amount that will allow you to still enjoy a great quality of life. Being house poor is never a great idea. Interest rates are 2% less than they were 7 years ago at the end of the recession. Interest rates impact affordability. Low interest rates also make it the perfect time to move up to your next home or your dream home. With the savings, many are finding it the perfect time to do so. As property values increase, property taxes increase for landlords. With higher prices, rent rates often increase. The increased demand will also increase rent rates. So if you are thinking of buying your first home, next home or dream home, call us at 561-376-2424.